تم تعیین درجة حرارة حرق بعض الکسر الفخاریة من تل آثار السمارة بالدقهلیة من خلال فحصها وتحلیلها بالمیکروسکوب المستقطب PLM والإلکترونی الماسح SEM وحیود الأشعة السینیةXRD والتحلیل الحراری TGAحیث أثبت البحث أن الطفلة المستخدمة هی الطفلة النیلیة، أما الإضافات تبین أنها عبارة عن التبن المقرط ومسحوق الفخار ومسحوق الحجر الجیری .کما أثبت البحث أن جو الحرق داخل الفرن للعینة الأولی والثانیة کان جوا مؤکسدا ،ودلل علی ذلک وجود الهیماتیت Fe2O3 والدایوبسید CaMgSi2O6، أما جو الحرق للعینة الثالثة کان جوا مختزلا، ودلل علی ذلک وجود المجناتیت . 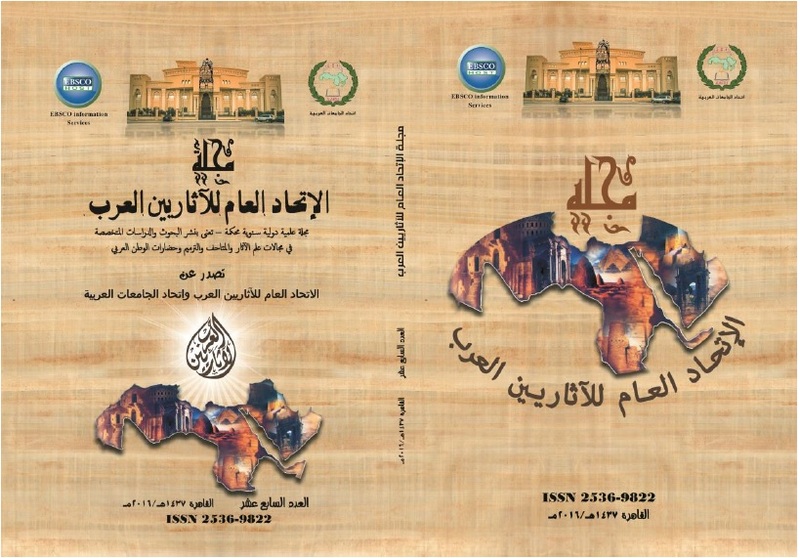 Fe3O4 ولقد أثبت البحث إختلاف درجة حرارة حرق العینات الفخاریة حیث کانت درجة حرارة الحرق حوالی 850 م5 للعینة الأولی،و حوالی 745 م5 للعینة الثانیة، وحوالی 673 م5 للعینة الثالثة، وأکد ذلک الفقد فی وزن العینة کان شبه ثابتا فی هذا المدی الحراری لکل عینة فخاریة.کما توصل البحث الی أن هناک علاقة بین درجة حرارة الحرق للفخار وخواصه الفیزیائیة والمیکانیکیة حیث إرتفاع درجة حرارة الحرق للعینة الفخاریة الأولی تسبب فی إحتواءها علی الدایوبسید وهو من الأطوار الزجاجیة التی تملئ المسام ، فمعدل ومیکانیکیة التلف والعلاج تتوقف علی تلک الخواص الناتجة عن درجة حرارة وجو الحرق للآثار الفخاریة. Firing temperature degree of some pottery has been determined from Tel al-samara in Dakahlia through their examination and analysis by polarized microscope "PLM", scanning electron microscope SEM,X-ray diffraction XRD and thermal analysis TGA where the search proved that the used clay is Nile clay, the tempers are sand ,burnt straw, grog and limestone powder. The research also proved that the firing atmosphere for the first and second sample was oxidized for presence of hematite" Fe2O3" and diopside" CaMgSi2O6" but for the third sample was reduced by the presence of magnetite" Fe3O4" . The search proved different firing temperature degree of pottery where it was about 850 c5 for the first sample, approximately 745 c5 for the second, and approximately 673 c5 for the third sample, it is confirmed by the loss in the sample weight was almost constant in this temperature range. The research proved a relationship between the firing temperature of pottery samples and their mechanical and physical properties as high firing temperature for the first sample pottery caused containing diopside as a glass phase filling the pores indicating a decrease in its water absorption property and poor porosity. The rate, mechanism deterioration and treatment depend on the properties resulting firing temperature and atmosphere for archaeological pottery. Arnold , D., " Techniques and traditions of manufacture in the pottery of Ancient Egypt " , in an introduction to Ancient Egyptian pottery , edited by Arnold , D., and Bourriau , J ., German in stitute of Antiquities , Cairo, 1993,p.84. Drebushchak, V. A., Mylnikova, L. N., Drebushchak, T. N., and Boldyrev, V. V., " The Investigation of Ancient Pottery and Application of thermal analysis" , Journal of Thermal Analysis and Calorimetry, Vol. 82, Springer Healthcare LLC, U.S.A,2005,pp.617-626. Garrison, E., G., Techniques in Archaeological Geology, Springer, Germany, 2003. Hamdan, M. A. Martinez, S. M. Garcia Valles, M. T. Nogues, J. M. Hassan, , F. A. Flower, R. J., Aly, M. H., Senussi A. and Ibrahim, E. S., " Ancient Egyptian Pottery From The Subsurface Flood Plain of The Saqqara–Memphis Area: Its Mineralogical and Geochemical Implications" ,Archaeometry, Vol. 56, N. 6, John Wiley & Sons Ltd., U.k,2014,pp.987-1008. Heimann, R., " Firing technologies and their possible assessment by modern analytical methods",in Archaeological ceramics, edited by Olin J. S. and Franklin, A. D., Smithsonian Institution Press, Washington,1982,pp.86-96. Henderson, J., The science and archaeology of Materials, RoutLedge, London, 2000. Hodge , H., Artifacts , An introduction to primativetechnology , London ,1964. Johnson , P.D ., Clay modeling for every one , Newzeland , 1988 . Maniatis, Y., Simopoulos, A., Perdikatsis, V., and Kostikas, A.," The effect of reducing atmosphere on minerals and iron oxides developed in fired clays" , Journal of the American Ceramic Society,Vol. 66,U.S.A, 1983,pp.773-781. Maritan, L., Nodari, L., Mazzoli, C., Milano, A., and Russo, U.,"Influence of firing conditions on ceramic products: experimental study on clay rich in organic matter" , Applied Clay Science, Vol. 31,No.1,Amsterdam, Netherlands,2006,pp.1-15. Murat Bayazit, Iskender Işık, Ali Issi, Elif Genç, "Spectroscopic and thermal techniques for the characterization of the first millennium AD potteries from Kuriki-Turkey", Ceramics International, Vol. 40, Amsterdam, Netherlands, 2014, pp.14769-779. Pankaj Singh, and Sukanya Sharma,"Thermal and spectroscopic characterization of archeological pottery from Ambari, Assam ",journal of archaeological science, Amsterdam, Netherlands, 2016,pp.557-563. Riley, J.,A ., "The Petrological analysis of Aegean Ceramics" , Occasional Paper, No.32 , Thin Section studies, British Museum, edited by Freestone, I. ,london, 1982,pp.1-8 . Schiffer, M. B., Behavioral archaeology, Academic Press, New York,1976. Shepard, A., Ceramics for the archaeologist, Washington, 1981. Tite, M.S., " The use of Scanning Electron Microscope" , in Archaeological ceramics , edited by Olin, J. & Franklin, A. , Smithsonian Institution Press, Washington D.C , 1982,pp.109-120. Zakin , R., Ceramics , mastering the craft , pennsylvania , 1997 .